The top job at the federal agency tasked with coordinating the relocation of Alaska villages threatened by climate change will soon be vacant. Joel Neimeyer will step down as federal co-chair of the Denali Commission when his term expires Friday. The Trump Administration has not yet named a replacement. The vacancy comes at a crucial moment for the agency. 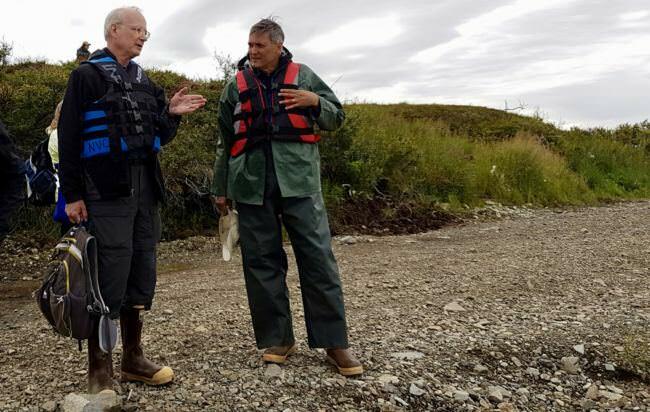 In March, Congress doubled the commission’s budget to $30 million, directing it to work with villages facing coastal erosion, flooding and degrading permafrost. Originally the brainchild of former Alaska Sen. Ted Stevens, the Denali Commission was established by Congress in 1998 to fund economic development and infrastructure in rural Alaska. In 2015, then-President Barack Obama added another mission: assisting Alaska communities threatened by climate change, like Newtok, Shishmaref and Kivalina. That has been a major focus for Neimeyer. During his eight years as the head of the agency, the commission has pivoted from funding new infrastructure to maintaining existing projects — and trying to raise awareness of climate impacts. Neimeyer said it’s sometimes been a lonely job. One of the biggest “issues of the day” during Neimeyer’s tenure has been the question of what to do about Alaska villages facing potential destruction. Neimeyer waged a dogged effort to unlock federal funding for climate-related erosion, work that paid off when Congress added $15 million to the commission’s budget as part of this year’s budget deal. Most of that money will go to relocate Newtok, the Western Alaska village most at risk. But now that the funding has finally arrived, Neimeyer’s term is ending. His exit leaves a big hole at the agency: only the federal co-chair can sign off on spending, so Neimeyer and his staff have worked overtime to approve projects before his last day. Still, Neimeyer said it’s a good time to hand over the reins. “Not everyone gets to cross the finish line, and I understand that,” Neimeyer said. The Trump Administration has twice proposed eliminating the Denali Commission entirely. Neimeyer, who was appointed under Obama, is a Democrat. He said the agency needs a Republican head to make the case for it within a Republican administration. Who that new blood might be remains an open question. The Alaska congressional delegation must nominate potential candidates to be appointed by the Trump Administration. A spokesperson for Sen. Lisa Murkowski said the senator is currently vetting potential candidates, but offered no prediction on when a replacement might be announced.